Home / Archive by Category "Archived Conferences"
How is everyone dealing with import tariffs on cut-to-size, what solutions have you found? Chris from Stoneworks – Effected greatly. Real hurdles on the new bidding because developers do not want to accept the price increase. Not bidding glass quartz either. Switched to cut to size granite, bidding it now with 25% tariff already in place. Nick Began – Glass quartz is already imported, already almost 100 containers – including MSI. Hired Adrienne Blogmiller, tariff law expert, her comments were to stay away from any glass quartz with more than 50% in content. Can fight it if it is 60% above in quartz content. Paul Menninger-Capitol Granite– Coming from the chemical industry in previous career, allows companies to have a range 40%-70%. Geoffrey – Has anyone tested this material? It is a new product with no testing done as far as he knows. Nick – Have to go to independent 3rdparty testing that believes is international, also did own testing in house. Are there any test results from this company? Yes – SGS is the service, performs close to the MSI’s Q Quartz. Jon Kaplan – does anyone know what is delayed in regard to the tariff? The 15% is pending depending on upcoming meetings with President and China. What more would you like to hear on this topic? Hear from reliable source/authority on what the latest and greatest is without sugar coating. Have a representative from MSI present to discuss what has been done on their end. If you are using Slabsmith to create a layout and seam information for your customers are you charging for it and if so how much can you get away with? We have done a fair amount at no additional cost and it is a value-adder and we would like to charge for it. just curious what others in the group are doing. Geoffrey-TCF – sells it for $250.00, posed as a convenience to the customer because it saves time. Don’t do it for builders, but will do it for commercial jobs, Box Stores (depends on store, but done with a custom sku. Make sure you are educating the store on what you are doing if you go this route), and residential. Matt from Colonial – was not successful in charging for Slabsmith at the higher level when brought up to Meredith. Work with stores one on one for this. $250 out of Big Box stores and $200 out of the showroom. Asking for this to be a SKU is the biggest challenge because not everyone can do it. This is why you request for a custom SKU. Does anyone do other up charges for Big Box? Geoffrey does do this, has around 15 items. Chip minimizer, plumbing – depends on what the customers’ needs are and also your capabilities. Customers want simplicity and ease of purchase so please keep this in mind. Jon Kaplan – Granite Gold being tested in some markets for program in the big box stores. Geoffrey Gran, TCF. Granite Gold test market. TCF is working and doing well. I have two sawjets and I’m in the market to upgrade my saw systems . I know about my fixed cost on owning saw jets . Could anyone tell me if they have replaced their Saw jets for CNC saws and besides operating expenses decreasing did the changeover to CNC saws VS. Saw jets decrease S/F production significantly? Paul Menninger – What would be the compelling event to go to CNC Saw vs. CNC Waterjet? Matt Scarsella from Tile & Stone – use CNC Saw without a sawjet and has manipulate and production is second to none. Have automatic loader and conveyer belt. Don’t use saw jet and cut 35-40 slabs a day on one saw. Buying decision – wanted to increase productivity. Added benefit of having saw that loads itself. Could not have done the same thing with a saw jet, it would cut the conveyer belt. Savings is in reducing cycle times. Just cutting blanks and marking where the seams are. Brian from Cutting Edge – removing waterjet will increase production time. Geoffrey – has 2 full-time plumbers on staff. Make $100K a year on both plumbers. Get to control the process. Find someone who is experienced. Do you have to be a licensed plumber? Every state is different, but in IL yes they must be licensed. Is there a break-even point? Charge, for HD, $350 for a basic reconnection. Anthony McGilvery-Valley Countertop IndustriesHired retired plumber for about a month to come train their installers how to do reconnection – their state does not require licensing. Rate of the hotel – Hotels.com $159 for single room. All condominiums on the property so there are flexible pricing options. Please be sure to register on the website. Please send them via the website or directly so they can be entered into the presentation. Grand Prize is being given by Sapienstone for all-expense paid trip to Italy (flights, hotel and meals) to visit the factory as well as enjoy time experiencing country and culture. In case you missed the call on Jan 9th, 2019 and you want to hear back what it was all about, great discussion! Click on this link for the full recording: Call recording and start at the 13:00 minute mark. Click link to listen start at 10:10 mark. We will be moving into a forum structure that will help facilitate more constructive dialogue. With a growing member base it can be challenging to communicate our ideas effectively in such a large group. If we break down into smaller groups then more meaningful dialogue will evolve naturally. Information on this new structure can be found on the powerpoint that is linked above. Dave Murray from The DiJulius Group gave us a spectacular lecture on customer service and how putting an emphasis on the customer experience can only yield net gains for your business. In case you missed the lecture we have attached their workbook, linked in the title. We are excited to offer you a new, perspective on Marketing strategies from one of the industries most talented speakers. Our featured speaker for the month of December will be John Ruhlin , author of “Giftology”. John will speak with us on marketing strategies that focus on building experiences and gift giving. He founded the Ruhlin Group in 2000 following a meteoric rise as the top Cutco salesperson. At this event you will learn how to use John’s “Proven Process” that has been disseminated to some of the top executives in the United States with overwhelming success. We are proud to have him speak to the ROCKHEADS! THE ROCKHEADS GO TO KBIS! Want to build better relationships with your clients? Or simply have an opportunity to network with new potential clients? This is your chance to be part of KBIS! The Rockheads have secured a special event for our members to invite their clients and host them during the show. Join NOW and take advantage of this VIP opportunity! Dan Simovic, CEO of The TAMS Group, will be speaking to us for our monthly conference call. Dan will cover several topics relating to recruiting top talent, onboarding new hires, & how you can respond to changing workplace demographics. Dial in information is linked below. Also, check out our video for an introduction to the topics being discussed in this call! The new Rockheads website is now ready to roll! We’ve added several new access points that we know you’ll find beneficial. 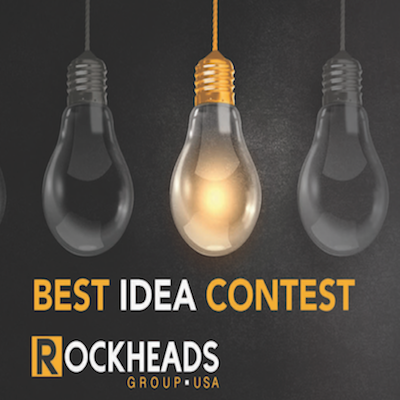 Visit us at www.rockheadsusa.com to navigate all the newly formatted content. To help you move along with ease, we’ve included some helpful tidbits and offer a brief video to walk you through the conference registration process. The retreat was a huge success! We would like to extend a massive ‘Thank You’ to Fred Christen & his team at Hallmark Stone for hosting us! The sharing of ideas and practices are what make this organization the best in the industry. Attached below are the documents that they were happy enough to share with everyone.